Within my portfolio allocation, utility income is an important component. There are currently eleven stocks in my utility portfolio. Over the past several months, except for lightening up on a few Dominion Energy shares, I have been doing nothing in my utility portfolio. 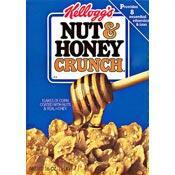 In the 1980s and 1990s, Kellogg (K) offered a breakfast cereal branded "Nut 'n' Honey Crunch". However, it has since gone the way of "Mr. T", "Pink Panther Flakes", and "Pop-Tarts Crunch" cereals, and is found in the archives of discontinued consumer products. It seems the average lifespan of new concoctions of breakfast cereals last only 5 years before it is cut from the line. Nevertheless, the marketing campaign for this cereal lives on in infamy. Introduced in 1987, Kellogg soon took to the airwaves with its iconic "nut 'n' honey" ad campaign, centered on the theme: What are you eating? Nut 'n' honey - and the subsequent interaction between married couples and between a military drill instructor and his team. A link to a 1989 ad is at the bottom of this article. However, this ad tag line also describes my activities concerning my current utility portfolio: What am I doing with my utility portfolio? Nut 'n' Honey (well - almost Nut 'n' Honey). My total investment portfolio is segregated and cubby-holed into several different asset classes. While a bit unconventional, I first split my holdings into four categories: Cash and CDs; Date Specific Bond ETFs; Equities Bought Primarily for Capital Gains; Equities Bought Primarily for Income. This segregation allows me to evaluate each position based on the overriding purpose for ownership. As I am in a "mostly" retirement mode, this separation also allows me to evaluate how each position is contributing to my overall total return. My personal investing risk profile includes a 3-year total return horizon for holdings and a reliance on fundamental analysis, coupled with third-party research. Equities Bought Primarily for Income - 39.0% of assets, 6.7% current yield, 65% of total account income. As shown, the largest income producing group are those equities bought primarily for that purpose - income. These selections include utility sector stocks, MLPs, and selected stocks with a high current yield. Of this group, regulated utilities account for 45% of the value and 35% of the income produced by this group of stocks. According to the Morningstar portfolio tracker, my utility sector allocation is 21.5%. The utility sector portfolio currently consists of the following 11 stocks: Dominion Energy Inc. (D), Emera Inc. (OTCPK:EMRAF), AltaGas Ltd. (OTCPK:ATGFF), CenterPoint Energy Inc. (CNP), Southwest Gas Holdings Inc. (SWX), FirstEnergy Corp. (FE), NextEra Energy Inc. (NEE), Entergy Corp. (ETR), Southern Co. (SO), National Fuel Gas Co. (NFG), Algonquin Power & Utilities Corp. (AQN). Some of these stocks I have owned for many years and have a relatively low purchase cost. Others are newer additions. As I approached the time to hang up my work boots, the focus of the portfolio moved from capital gains and asset accumulation to income plus growth and total return. Thus, the classification of "bought primarily for income" grew in size and importance, anchored by the utility sector. Below are a few comments I have on each of these selections. Dominion Energy towers over the others in portfolio positioning, and somewhat by accident. D is a relatively new position, starting in March of 2015. However, I have been a strong proponent of its previous LNG export MLP spinoff - Dominion Midstream (DM) - since its IPO in Oct. 2014. My preference was DM over D, until unit prices collapsed with the FERC ruling of a year ago and the roll-up back into D. However, with the drop below $15 in early 2018, additional shares purchased reduced both my "average cost" and the "capital account" per share, as offered in the annual K-1. Adding to my DM position was speculative buys of SCANA during the topsy-turvy merger process when share prices for the target sank below $40 from Dec. 2017 to Oct. 2018. With the conversion of DM and SCG to D shares, my position in Dominion Energy became twice the size of what I consider "maximum weighting" of a position of 2.5% to 3.0% of total assets, and much larger than my usual "target weighting" of 1.8% to 2.0%. The "almost" comment above refers to my current approach of selling a few Dominion Energy shares when prices peek above $77. As this is my initial cost going in, I am effectively replacing these higher priced shares with lower cost shares accumulated in these two events. I intend to reduce my position by around 12% and am a little less than halfway there. In recent weeks, management has dialed back its growth forecast due to higher "efficiency" capex, a delay in the Atlantic Coast pipeline, and toxic coal ash disposal costs. Previously, investors were looking for 10% dividend growth over the next few years but should now expect a ~ 5% growth rate going forward. As investors have dialed back their expectations, share prices seem fully valued over the medium term. CFRA rates Dominion with a 10-yr consistency in profit and dividend growth SPGMI's Quality Ranking of B. Using 2019 estimated earnings per share and its "normal PE ratio" of 16.6, fastgraphs.com estimates a fair valuation is $70.00. Consensus price target is $77.00, Morningstar "fair value" is $84, and the current yield is 4.45%. While D will remain an overweighted position, its exposure to non-PUC regulated businesses and the earnings impact of lower federal income taxes associated with these businesses should add to the stock's desirability. Investors should be searching for utilities having substantial and profitable non-PUC regulated assets as most state-regulated utilities have returned any corporate/shareholder benefits of the 2018 tax adjustment to ratepayers. Businesses such as D's LNG export facility Cove Point are not included in regulators' tax relief/rebate requirements. I first took notice of Canadian utility Emera when it bought one of my micro-cap utilities, transmission owner Maine and Maritime, in 2010. EMRAF is the parent of its original electric utility, Nova Scotia Power, and expanded in 2015 by purchasing Tampa-based TECO. In the mid-2000s, Emera also played investment banker for Algonquin Power's US expansion, buying a portion of most every equity raise used to finance AQN's purchases. Over time, EMRAF had accumulated a 64 million share position, and it seems a good merger match. However, in 2015, management abruptly changed course, selling its AQN position to finance its TECO acquisition. Currently, EMRAF is readjusting its assets to pare down debt and recently announced the sale of some of its Maine-based assets. I like EMRAF's added exposure to what I believe is an over-valued US dollar, where weakness against the Canadian dollar will push up the converted rate for share prices and cash dividends. For US investors, there are dividend withholding issues with Canadian dividend payers. The Canadian government imposes a 15% dividend withholding tax for non-IRA accounts (IRA accounts are exempt), which is recoverable as a credit offset up to $600 on the first page of IRS form 1040 (but always check your personal accountant). CFRA rates Emera with a 10-yr consistency in profit and dividend growth SPGMI's Quality Ranking of B. Using 2019 estimated earnings per share and its "normal PE ratio" of 17.0, fastgraphs.com estimates a fair valuation is $37.86. Consensus price target is $40, and the current yield is 4.70%. This addition predates the acquisition announcement of Washington DC-based Washington Gas. I am not thrilled by the performance of management's moves concerning a realignment of its assets nor of the value of my investment since the announcement. As my total return moves closer to break-even, I expect to look favorably on redeployment of this capital. The same Canadian utility investment considerations (exchange rate and withholding tax) for EMRAF applies here as well. Using 2019 estimated earnings per share and its "normal PE ratio" of 19.7, fastgraphs.com estimates a fair valuation is $14.23. Consensus price target is $14.55, Morningstar "fair value" is $15.63, and the current yield is 5.31%. CenterPoint was added in Feb. of 2015, during a general market decline. The diversity of electricity and natural gas, combined with its geographic service areas covering both the vibrant Houston area and the Midwest, is attractive from a long-term vantage point. CNP's large ownership of its spin-off MLP, focused in the STACK play, adds to its cash flow and supports overall dividend growth. CFRA rates CenterPoint with a 10-yr consistency in profit and dividend growth SPGMI's Quality Ranking of B. Using 2019 estimated earnings per share and its "normal PE ratio" of 15.0, fastgraphs.com estimates a fair valuation is $25.05. Consensus price target is $32, Morningstar "fair value" is $29.00, and the current yield is 3.78%. As a relatively recent holding, SWX was added in Feb. of 2018. The firm services Arizona and Nevada areas, and earnings growth is augmented by its utility construction subsidiary. With most natural gas utilities under pressure to upgrade their distribution pipes, SWX seems well positioned to benefit from this long-term trend. In addition, as one of the "newest" gas utilities, SWX's exposure to ageing and cast-iron pipe replacement is lower than many of its peers. CFRA rates Southwest Gas with a 10-yr consistency in profit and dividend growth SPGMI's Quality Ranking of A-. Using 2019 estimated earnings per share and its "normal PE ratio" of 18.3, fastgraphs.com estimates a fair valuation is $70.92. Consensus price target is $80.83, Morningstar "fair value" is $73.77, and the current yield is 2.62%. FE is also a recent addition as of Jan. 2018, based on its potential after exiting the merchant power business. The auction-based, short-term pricing schemes for electricity supervised by JPM has cratered the price of the commodity in the Northeast, Mid-Atlantic, and eastern Midwest. The subsidized nature of renewable power, coupled with low natural gas pricing, has dampened merchant power profitability, with little relief in sight. Supported by 10 distinct local utilities with 6 million customers and an extensive 24,000-mile transmission network, FE should offer stable earnings and dividends going forward. FE should be considered as a more speculative selection until all issues are resolved with its merchant power assets. CFRA rates FirstEnergy with a 10-yr consistency in profit and dividend growth SPGMI's Quality Ranking of B. 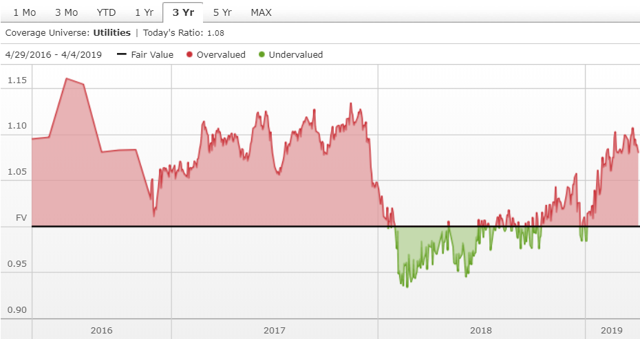 Using 2019 estimated earnings per share and its "normal PE ratio" of 12.6, fastgraphs.com estimates a fair valuation is $32.63. Consensus price target is $43.87, Morningstar "fair value" is $41.00, and the current yield is 3.76%. I added this position early in 2017. The low cost of service, coupled with its population and economic growth profile, makes NEE's regulated businesses quite attractive. Investors should not underestimate the value to overseers of having one of the lowest electricity rates in the US. The advent of "cost competitive" battery storage has the potential to turn intermittent supplies of wind and solar power into base-load power - and directly compete with nuclear, natural gas, and the remnants of the coal-fueled power industry. While in the past, I railed against the European electricity model of oversupply and negative power pricing caused by too much grid power driven by the preference given renewables, the ability to convert intermittent power into base-load is as disruptive a technology as found in other sectors. NEE, as a leading solar and wind power generator, will have a substantial advantage as this disruptive utility trend takes hold. CFRA rates NextEra with a 10-yr consistency in profit and dividend growth SPGMI's Quality Ranking of A. Using 2019 estimated earnings per share and its "normal PE ratio" of 16.0, fastgraphs.com estimates a fair valuation is $134.00. Consensus price target is $195.03, Morningstar "fair value" is $175.00, and the current yield is 2.64%. Serving the Mississippi Delta, ETR is well poised to continue to benefit from the region's economic boom taking place, especially in high energy use businesses such as petrochemical manufacturing. Much like a few of its peers in the merchant nuclear power business, ETR is in the process of retiring four of its nuke plants - one each in 2019, 2020, 2021, and 2022, and by 2023, should exit its merchant nuclear power business. Remaining will be five utilities servicing 3 million customers in Arkansas, Louisiana, Mississippi, and Texas. I have been a long-term shareholder of ETR. CFRA rates Entergy with a 10-yr consistency in profit and dividend growth SPGMI's Quality Ranking of B. Using 2019 estimated earnings per share and its "normal PE ratio" of 12.9, fastgraphs.com estimates a fair valuation is $68.53. Consensus price target is $98.21, Morningstar "fair value" is $98.00, and the current yield is 3.86%. Southern Company has been a very long-term holding for the portfolio. The historically great relationship between SO and its regulators is being tested by the construction cost overruns of its nuclear power plant and the failure of CO2 capturing technology, aka Clean Coal, at its Kemper plant. SO service territory continues to offer strong economic growth, and this underlying advantage should not go unnoticed. Combining this growth with a recent diversification into natural gas utility operations, with accompanying midstream opportunities, should create acceptable total returns for patient investors. CFRA rates Southern with a 10-yr consistency in profit and dividend growth SPGMI's Quality Ranking of B+. Using 2019 estimated earnings per share and its "normal PE ratio" of 15.7, fastgraphs.com estimates a fair valuation is $47.54. Consensus price target is $50.03, Morningstar "fair value" is $52.00, and the current yield is 4.65%. Another long-term position, National Fuel Gas is a Marcellus-focused natural gas E&P with utility and midstream assets. One of my previous NFG reviews is titled, "Come for the utility, Stay for the Marcellus natural gas". NFG has one of the largest acreages in the Marcellus, 700,000 acres in the fairway, and it is fee-owned (company-owned). This translates into no land leases, no time pressures to drill in order to hold a lease, and total company control over the drilling process. In addition to the core land holding, NFG has additional leased land, but its substantial fee-owned assets create the differentiation. NFG operates the local gas distribution company for Buffalo, western NY, and Eire PA areas. Midstream assets include pipelines, processing plants, and natural gas storage facilities. Mario Gabelli's Utility Fund (GABUX) owns a sizable position and has tried to convince the company to split its utility from its midstream and E&P assets, but to no avail - so far. One large obstacle to NFG growth in midstream assets is the inability of New York regulators to approve various pipeline projects. This has hamstrung expansion plans and has negatively affected NFG's potential. The lack of overall pipeline capacity in NY is credited with the decision to freeze new natural gas hookups downstate. The current administration is seeking way to resolve the regulatory roadblocks to more Northeast pipelines. CFRA rates National Fuel Gas with a 10-yr consistency in profit and dividend growth SPGMI's Quality Ranking of B. Using 2019 estimated earnings per share and its "normal PE ratio" of 17.1, fastgraphs.com estimates a fair valuation is $60.14. Consensus price target is $58.00, Morningstar "fair value" is $57.03, and the current yield is 2.80%. Algonquin is a Canadian-based diverse utility with multiple US regulated assets. AQN was originally formed as a Canadian Income Trust. In 2006, its share price collapsed with a ruling by the Canadian government that removed the tax advantages of this corporate structure. Known as the Halloween Massacre, most investment trusts lost a majority of their value almost overnight and is akin to our IRS removing the tax advantages of the MLP sector. During the early 2000s, I purchased several income trusts, including timber and peat moss harvesters. AQN was first purchased in late 2006 and into 2008 and 2009. As a roll-up consolidator of micro-cap utilities, AQN has complied transmission, power generating, natural gas distribution, and water utility assets. AQN trades on major US exchanges but reflects the Toronto trading valuations, and the dividend is paid in US dollars. This means there is currency exchange influence on share prices, but exchange rates will not impact dividend distributions. Recently, management has turned its investment attention to European power generation over an expansion of its US utility footprint. I personally don't appreciate management's recent abandonment of the consolidation trend in the US utility sector in favor of international renewable power generation. Using 2019 estimated earnings per share and its "normal PE ratio" of 15, fastgraphs.com estimates a fair valuation is $14.50. Consensus price target is $11.00, Morningstar "fair value" is $10.19, and the current yield is 4.50%. I agree there is little value to be found in most of the utility sector. However, longer-term investors may find adequate potential total returns in some of the stocks listed above. Recently, I have been doing almost nothing to my utility portfolio, except for trimming a few shares from my Dominion Resources over-weight position. While I monitor my utility positions constantly, doing "nut 'n' honey" is just how I like it. For old fashion breakfast cereal enthusiasts, Nut 'n' Honey Crunch was merely a standard corn flake with honey and peanuts added to spice it up. The ingredients listed on a 1993 box included: corn, sugar, peanuts, corn syrup, partially hydrogenated cottonseed oil, salt, honey, malt flavoring and a sprinkling of vitamins and iron. A YouTube of the famous 1989 tv commercial is linked here. Author's Note: Please review my SA profile page for the essential disclaimers. Disclosure: I am/we are long D, EMRAF, ATGFF, CNP, SWX,FE,NEE, ETR, SO, NFG, AQN. I wrote this article myself, and it expresses my own opinions. I am not receiving compensation for it (other than from Seeking Alpha). I have no business relationship with any company whose stock is mentioned in this article.